It only took 17 years, but they're finally listening. This is what Rooseveltian resolve looks like. That, of course, is what a then-professor named Ben Bernanke said Japan needed to have to break out of its post-bubble blues back in 1999. Now, that didn't mean their leaders had to adopt a patrician lilt to their voices, or come up with pithy formulations about what we do and do not have to fear, or even go on the radio to reassure everyone that everything would be okay. It just meant that, like FDR, they had be willing to try something to get their economy moving again, and to keep trying until something worked. The latest news is that their central bank, the Bank of Japan, is not in fact giving up on its 2 percent inflation target. There had been rumors it might after three years of printing money wasn't enough to stop prices from falling for very long. Instead, though, the BOJ is now saying that it's going to deliberately try to get inflation to overshoot its 2 percent target, and will do so until it stays there "in a stable manner." To back that up, it's not only going to keep buying stocks and bonds with newly printed money, but will also buy as many (or as few) of them as it takes to keep the government's 10-year borrowing costs at zero percent. But let's back up a minute. Why has Japan needed to channel FDR at all? Well, it was the first country to go through the kind of boom, bust, and stagnation that the rest of the world has since 2008. This is both better and worse than it sounds. Better because Japan's economy has actually done about as well as ours has the past 25 years once you account for the fact that our population is growing and Japan's is shrinking. But worse because it should have been growing faster than ours considering that it isn't quite as rich as we are. Indeed, as Berkeley economist Brad DeLong points out, Japan had been catching up to us a pretty rapid rate before its "lost decade" began in 1991. Since then, though, it's stopped doing so. Japan, in other words, wants to make its economic growth great again. To get out of the good-but-not-good-enough rut that its falling prices would have made even worse if it weren't for its rising debt, and get into a strong cycle of growth that makes prices rise and debt fall. It's a lot closer to that than you might think. Shinzo Abe's government, you see, has taken the revolutionary step of actually listening to economists. It's done what Paul Krugman and Ben Bernanke said it should all those years ago, and told the BOJ to do whatever it takes to get inflation back into positive territory. Now, it managed to do so for a little while, but only just. An ill-timed tax increase and the oil price crash sent prices back down again in rather short order. But these, as economists would tell us, are only transitory factors. They will pass. And when they do, the BOJ's strategy of buying stuff with newly printed money should push up prices just like it's pushed up employment. You can see that in the chart below. 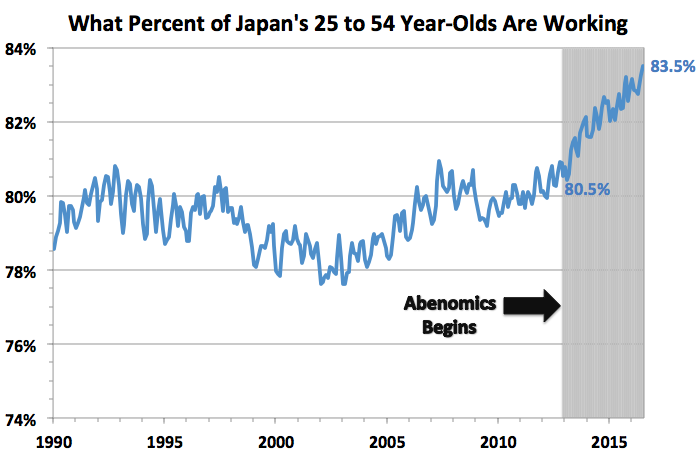 Ever since Abe announced that he was going to try to whip deflation, the share of Japanese 25- to 54-year-olds who are working has increased from 80.5 percent to an all-time high of 83.5 percent. By point of comparison, that's gone from 75.9 percent to 77.8 percent in the United States during that time. The good news, then, is that everything the BOJ's been doing would probably work if you gave it more time. The better news, though, is it's not satisfied with that, and is doing more to try to get it to work in less time. Now, maybe its latest measures won't actually speed things up. Maybe markets will interpret the BOJ's pledge to buy enough bonds to keep the 10-year yield at zero as an admission that there aren't enough bonds to buy anymore, since it wouldn't take a lot of buying to keep that promise right now. That, at least, seemed to be investors' initial response — although it's almost besides the point. What really matters is that the BOJ is showing us it wants more inflation, and that it's not going to give up trying to get it. Or, as a certain U.S. president might put it, that the only thing we have to fear is a fear of trying.